17 For I am about to create new heavens and a new earth; the former things shall not be remembered or come to mind. 18 But be glad and rejoice forever in what I am creating; for I am about to create Jerusalem as a joy, and its people as a delight. 19 I will rejoice in Jerusalem, and delight in my people; no more shall the sound of weeping be heard in it, or the cry of distress. 20 No more shall there be in it an infant that lives but a few days, or an old person who does not live out a lifetime; for one who dies at a hundred years will be considered a youth, and one who falls short of a hundred will be considered accursed. 21 They shall build houses and inhabit them; they shall plant vineyards and eat their fruit. 22 They shall not build and another inhabit; they shall not plant and another eat; for like the days of a tree shall the days of my people be, and my chosen shall long enjoy the work of their hands. 23 They shall not labor in vain, or bear children for calamity; for they shall be offspring blessed by the LORD-- and their descendants as well. 24 Before they call I will answer, while they are yet speaking I will hear. 25 The wolf and the lamb shall feed together, the lion shall eat straw like the ox; but the serpent--its food shall be dust! They shall not hurt or destroy on all my holy mountain, says the LORD. This is a picture of the new Jerusalem which will be like the Garden of Eden only better. All will live a full, healthy, happy life (100 or more years), enjoy the fruit of their hands and families. 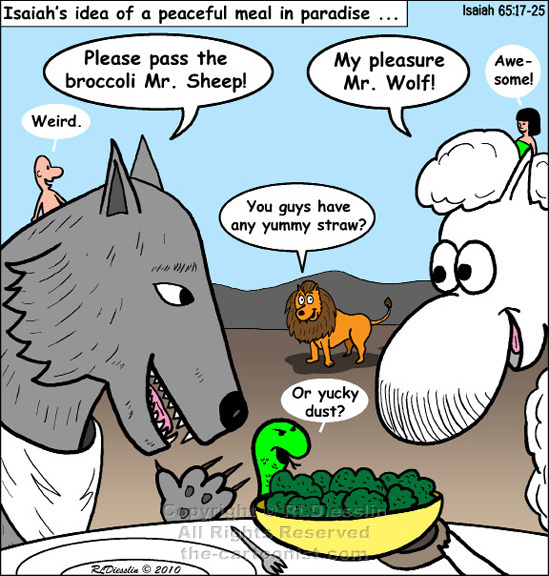 There is joy, peace and harmony in all the land - the wolf, lamb, lion and ox will all eat together and the serpent will be stifled (eat dust). This picture of the new creation is also referred to in the New Testament (2nd Peter 3:13 and Revelation 21) with regard to a post-apocalypse new beginning for the world. You have to admit, it would make for an interesting buffet.